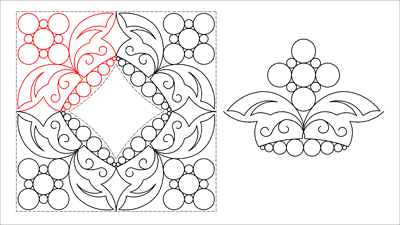 The lower circles of this design have been dropped a little to fit into the space when the dimensional centres of the block have been turned - Cathedral Window style. These designs are for what are often referred to as '10 minute blocks' where 5 pieces of layer cake fabrics are sewn together into a bow tie effect. There is a large area to be quilted, and this design does it nicely. I am going to make and quilt this one - now just to choose a design for the centre. I will quilt this separately so that I can ease the hopping foot over all the layers.